People and cars go about their business on a Sunday afternoon at Beaverton Mall. This time-laps image captures their motion through one vertical slice in space. I capture color from this slit and spread it across an image in a smooth sweeping motion to make the picture you see here. I fold one long skinny image over and over on itself just to make it easily viewable on normal computers. I could just as easily make a one inch high and ten feet wide image if I had some way to print it. Look for the traffic light in this five-minute exposure. It runs across the top of each stripe, sequencing green, yellow, red and then green again. You can tell from this that time advances to the left. That is, the newest part of the image is on the top left. You can also tell which way time advances by which way the cars are pointing. Going forward, their hoods pass through our observational slice first; the trunk last. 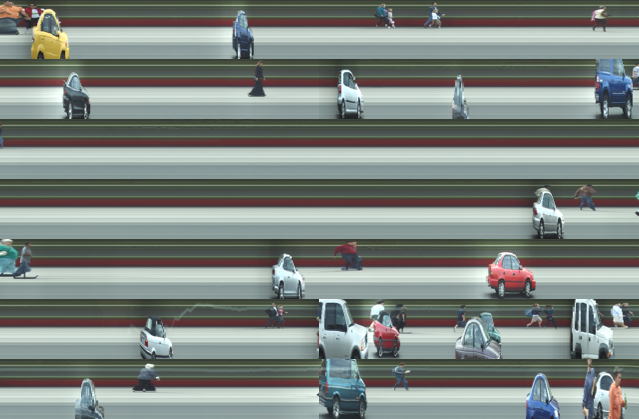 In these pictures the cars always point toward the older image, no matter which way they were moving in real life. I store very long pictures on the computer by breaking them into 10-second segments and then reassemble these in long rows on web page. The pictures in the paragraphs above are screen captures from these pages. Here you can look at the raw segments in a variety of sizes, small, medium, and so on. The larger sizes would look best on the largest displays. Firefox 3 can shrink images as it shrinks a page. Try firefox 3 if you want to see how segments fit together on a very large display. Fast-moving things get squeezed horizontally in my pictures. I compensate for some of this effect in the smaller versions by shrinking the vertical direction more than the horizontal in all but the Large version of these pages. Wayne Downer and I recorded these images live using a Fire-Wire tap from his DV video camera. The camera is mounted on a Manfrotto Arm clamped to the roll cage of my Jeep Wrangler. Wayne ran both the computer and camera; I wrote software and drove the Jeep. Quartz Composer does the capture and processing. The ImageWriter Composer plug-in records the segment files.